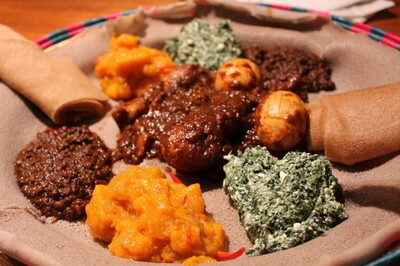 This is one of my favourite Ethiopian dishes, which I learnt about in Ethiopia during a couple of visits. It is a very rich dish for a special occasion, typically eaten with injera (Ethiopia’s staple flat ‘bread’) and ayib be gomen (cottage cheese with spinach). Minchet abish is to the left in the photo. It looks deceptively simple – minced beef – but is exquisitely flavoured with fenugreek (abish) and a range of other hot and warm spices. Injera, berbere, nit’ir qibe (spiced butter) and shiro powder are available in London’s Ethiopian shops and restaurants.